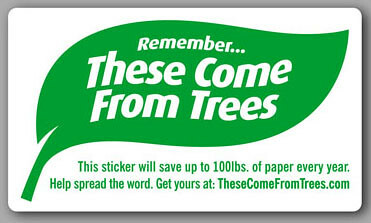 The Environmental Action Club at my high school (Amherst Regional) would love to put these stickers on all of the paper towel dispensers and photocopiers in our school. I saw your Education Challenge and was wondering who to contact to receive complimentary stickers. I know we have at least 50 dispensers/photocopiers, so that would be a good amount to start with. Just email to thesecomefromtrees@gmail.com ! Excellent information. Thanks for sharing this movement. It's a much needed step for a better environment. Shipping factoring present assure that all parties get their money on measure. From the shipper to the transmitter commerce faculty be prefabricated on instant. We've been really trying to save paper in our business too. For example, we FAX many of our documents instead of print and mail. This saves trees and fuel costs. Protecting our environment is really important and we all must do our part. Make sure to recycle any extra paper used, too often it is protect the tress with trees (paper) as the medium for trying to raise awareness. As a facility manager for an urban HS with over 3000 teens I can see the benefit of the stickers on both paper towel dispensers and copy machines. However stickers do not look new for long, especially in a high school bathroom. Can you tell me what kind of adhesive was chosen for these stickers, and what kind of ink or coating is on the surface? Are they easily removable for replacement if they become part of a graffiti action or damaged by cleaning products? One of the way to go paperless is adopting CRM software in our organization, which in turn can save our environment to a great extent. And of-course what you have written is a great step indeed! Keep up the good work and let us know too! Since the inceptions of educational belongings in the school each step has been improving the potential guidelines for the smoother operational plan for all. in order to find out the functional action issues in precise manner before mentioned guidelines are the productive action plan for all. We can get college paper writing service reviews from online.